The human figure is the main subject that traditionally has engaged African artists. 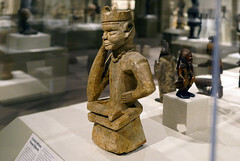 African figurative sculpture usually departs from natural proportions. There is often a conceptual basis behind artistic conventions such as the simplification and exaggeration of the human features. 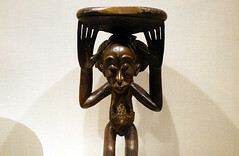 For example, in many African artworks, the head appears proportionately larger than the body. This formal emphasis has symbolic meaning, as the head is believed to have a special role in guiding one’s destiny and success in many African societies. African artists also employ scale for symbolic effect in multifigure compositions, a practice known as hierarchical representation. In these cases, the most important individual is depicted as the largest figure, while those of lesser importance decrease in size exponentially (above). Animals with special attributes—such as antelopes, snakes, leopards, and crocodiles—are represented in art for symbolic purposes. For example, the nineteenth-century Fon king Guezo is represented by a buffalo, an animal signifying strength and determination, selected as his emblem through fa divination (above). Representations of animals consuming other animals (below) may serve as a metaphor for competing spiritual or social forces. Their depiction is meant to encourage other, less destructive means to resolve a difficult social encounter. Features of different types of animals may also be combined into new forms that synthesize complex ideas. Among the Bamana, for example, ci wara headdresses are based on the features of various antelope species and may also incorporate those of aardvarks, anteaters, and pangolins, all highly symbolic animals. The resulting synthesis of animal forms evokes the mythic Ci Wara, the divine force conceptualized as half man and half antelope who introduced agricultural methods to the Bamana. Animal symbols may also take more abstract form. In the Cameroon Grassfields, circular medallions represent spiders, a symbol of supernatural wisdom, and diamond- shaped motifs refer to frogs, which stand for fertility and increase (image 26). Some forms of symbolism in African art use plants as points of reference. 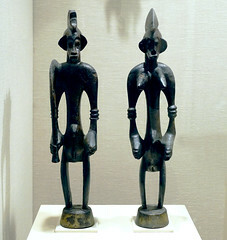 On cast plaques from Benin, a background pattern of river leaves is a symbol for Olokun, god of the sea (below). Symbols may be nonrepresentational. Geometric patterns on Bwa plank masks have multiple levels of meaning that refer to ideals of social and moral behavior taught to initiates (example here). Materials also hold symbolic value. Gold foil used in Asante regalia alludes to the sun and to life’s vital force (example here). Indigenous forms of writing, such as nsibidi used among various cultures in Nigeria’s Cross River region, embody multiple levels of symbolic meaning that can be accessed only by the initiated. Gestures, too, are a form of symbolism (see the example above where painted designs on the forehead and cheeks of the faces represent nsibidi, an indigenous writing). 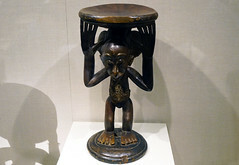 In Kongo art, a seated pose illustrates a dictum about balance, composure, and reflection (example, below), while a protruding tongue refers indirectly to the activation of medicines. Cite this page as: Dr. Christa Clarke, "The human figure, animals and symbols," in Smarthistory, October 9, 2016, accessed April 19, 2019, https://smarthistory.org/depictions-of-the-human-figure-and-animals/.